Gray wolves, also known as "timber wolves" or "common wolves," are the largest members of the wild Canidae family. The average measures between 3.5 and 5.5 feet long, and weighs approximately 80 pounds. Despite their name, a wolf’s fur can range in color from almost pure white to black. The most common shade is tawny brown. Gray wolves are social animals, and form packs of up to 12 members, usually consisting of a nuclear family. Wolf packs contain a dominant, or “Alpha” male and female, their offspring, and other wolves not related to the dominant pair. All of the wolves have a rank that determines their roles and hierarchy in the pack. 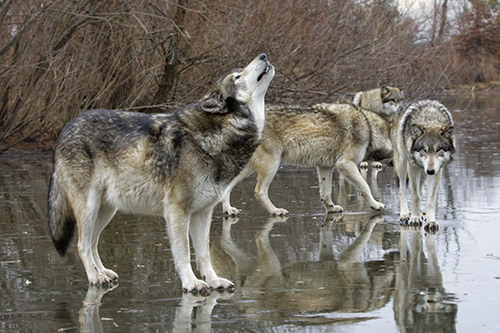 Wolves are well known for their distinct sound: the howl. This unique noise can travel for several miles. Wolves howl for a number of reasons, including communication with other packs and with their own pack over long distances, to gather a pack for a hunt, to warn off intruders, or to attract mates. Wolves can thrive in a variety of environments from the tundra to the woods, forests, grasslands and even deserts. 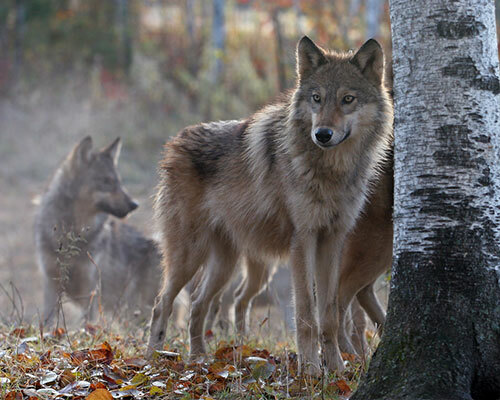 Wolves require large areas capable of supporting stable populations of their prey. The range of a wolf pack typically varies from 80 to 300 miles, depending on the number of prey species inhabiting the region. In extreme northern regions, territories can cover over 1,000 square miles. Wolves primarily use their hunting energy to target large hoofed animals like deer, moose, bison, mountain goats, sheep, elk, and caribou. Despite the wolves' extremely acute hunting skills, most of the animals they stalk eventually escape. Wolves are also opportunistic hunters, and will target small prey if it is available to them, such as rabbits, snakes, mice, birds, fish, and beavers. Wolves can go longer than a week without eating, with one known case of a wolf surviving for 17 days without food. Wolves have 42 highly specialized teeth. Their canines, or "fangs," measure around 2-1/2" long, and they also have large molars for crushing and grinding bones. The jaws of a wolf are extremely powerful, and the wolf has a biting capacity of between 1,000 and 1,500 pounds per square inch. Wolves are typically the apex predators in their range, challenged only by tigers and humans. The female alpha wolf makes a den and stays with her cubs for several weeks, while other wolves from the pack bring her food. After several weeks go by, the female alpha emerges for a short while to find her own food, but returns to the den immediately after. Wolves are monogamous; they stay with the same mate for life. The gestation period for a wolf is only about 63 days. A wolf pup’s eyes open 15 days after being born. In colder regions, wolves can reduce the flow of blood near their skin to conserve warmth. Wolves have very dense outer fur in the winter, with shorter underfur and long, coarse guardhairs. They will shed most of their underfur and some guard hairs in the spring, and then grow the fur back in the autumn. Wolves usually have longer hair on their back front quarters and neck, which almost form a crest. A wolves winter fur is especially well adapted to the cold, and can help it comfortably withstand temperatures of up to -40° when curled up. Wolf fur does not collect ice when warm breath is condensed against it. 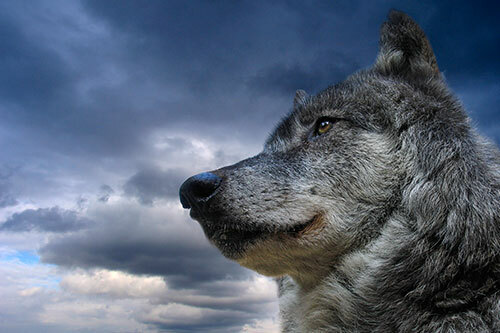 The gray wolf's sense of smell is relatively weak compared to some hunting dog breeds; however their auditory perception is sharp enough to hear the fall of leaves. Wolves primarily use their hunting energy to target large hoofed animals like deer, moose, bison, mountain goats, sheep, elk, and caribou. Despite the wolves' extremely acute hunting skills, most of the animals they stalk eventually escape. Wolves are also opportunistic hunters, and will target small prey if it is available to them. Wolves will chase their prey if it flees, and are good sprinters, capable of hitting speeds of up to 38 miles per hour. They are also highly capable distance runners, and have been known to chase deer up to 12 miles. Wolves can eat as much as 22 pounds of meat in one sitting. Eating large amounts after a big kill is necessary because their hunts take so much effort and are not often successful. Gray wolves were hunted nearly to extinction in the continental U.S. due to the threats they posed to human safety and livestock. Today, their population is mainly confined to northern regions with sparse human populations and areas to which they have been reintroduced, like Yellowstone.